With the upcoming software update, Microsoft will let users store and playback games from their hard drives — sort of. Gamers will still need to place the game disk in the drive for piracy reasons, but it won’t spin during gameplay. What this means is quieter gaming and quicker load times. Microsoft Xbox boss Don Mattrick says that the 12 million-plus members of Xbox Live have spent more than $1 billion with the service. Mattrick also says the North American sales of Xbox 360 have reached 10.3 million units, five million more than rival Sony and its PlayStation 3. Xbox software has accounted for more than $2.7 billion in sales the past 12 months. Nintendo will introduce today the Wii MotionPlus accessory for its Wii Remote controller. The accessory snaps into the end of the Wii Remote and, combined with the accelerometer and sensor bar, allows for more comprehensive tracking of a player’s arm position and orientation for improved precision and immersion. Even so, during the first five months of 2008, the Nintendo has sold 2.8 million Wiis in the United States to Sony’s 1.2 million PS3s. 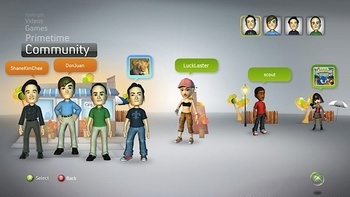 Microsoft is definately borrowing from the success of the Nintendo Wii avatars, known as Miis, in the upcoming software makeover. That’s OK. The Xbox 360 avatars may not be as cute as the Miis, but they’re still pretty nice-looking. Check out more Xbox avatars at Engadget.